For many years, The Christian Brothers Cream Sherry has been a popular alternative to aperitifs and after dinner wines. With its full bodied caramelized character, Cream Sherry makes a wonderful complement to chocolate and sweet desserts, or it can be enjoyed as a smooth and mellow sipping wine throughout the evening. Continuing The Christian Brothers' long tradition of classic sherries, Dry Sherry is a wonderful before dinner drink. With its toffee and nut flavours, and hints of persimmon, this medium bodied sherry is an excellent accompaniment to appetizers, light soups, smoked salmon or turkey. 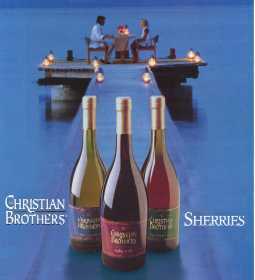 Enjoy The Christian Brothers Dry Sherry as a welcome alternative to white table wine. The Christian Brothers Ruby Port is an excellent accompaniment to rich desserts such as one of the blue-veined chesses. Prepare a plate of cheddar, Gorgonzola or Stilton cheese, seasonal fruit and spiced nuts to please every guest. And Ruby Port is a wonderful accompaniment to roasted or highly flavored red meats. It is also an excellent alternative to brandy. Ruby Port is aged in the European Port tradition in oak casks. It is bright, fruity and medium bodied with the deep red colour that gives it the name "Ruby" and a velvety soft finish. The generous flavour is reminiscent of cherries bathed in luscious chocolate. The Christian Brothers Tawny Port can be served warm, an exquisite alternative to cognac. Served slightly chilled, it is the perfect accompaniment to a platter of mellow, aged Gouda cheese or Parmigiano-Reggiano with fresh dates and roasted walnuts. Serve it as the perfect accompaniment to rich deserts-like a deep, dark chocolate. Or try it with tiramisu or a crème brulee. The Christian Brothers Tawny Port also goes very well with a fine cigar. The full bodied flavour suggests raspberries, chocolate and spiced apples with a long, spicy and fruity finish. The aging in oak casks draws out the rich, red colour until it mellows to its tawny golden shade. 2018 © Heaven Hill Distilleries NZ Ltd. All rights Reserved | Designed and Hosted by Design Shore Technologies NZ Limited.